Every writer and poet can benefit from a lesson or review in worldbuilding because every story has a setting that occurs in some form of time and space. The best storytellers (including nonfiction writers!) can craft a world around their protagonists that becomes a character of its own, that lives and breathes, and that acts upon the protagonists in the story with as much intensity as any villain or friend. There are countless examples of authors who give us worlds that we are just as enamored and enthralled with as we are with the characters that made them famous. From J.R.R. Tolkien’s mind-blowing land of elves and orcs in the award-winning The Lord of the Rings series to the engaging landscape of 1980s Iran from the mind of 14-years-old Marjane Satrapi in the nonfiction graphic novel Persepolis. So how do YOU do it? Well, we’re going to look at some of the greats at this. As I said, there are COUNTLESS writers we can point to…these are just some of my favorites. Feel free to give some examples of your own in the comments below! 1. There’s a science to this thing. You don’t have to get Star Wars technical about how you write your next great literary work, but trust me that it does need to make sense. Our suspension of disbelief does not qualify you to suspend good effort from the backstory. Your world should be self-explanatory and answer some key questions about why your setting is the way it is or how it came to be. Don’t just say it…make me believe it. For the same reason that Newton’s apple fell out of the tree in the real world, the laws of physics (or possibly lack thereof) should apply in ways your readers can wrap their minds around. Just because you have a futuristic sci-fi thriller that involves instantaneous time travel, does not mean you get to jump over the small details. What kind of change does that have on the time stream or the human body? Does your story involve magic? Well, magic has rules just like everything else in the world. Does it work like a muscle from the inside out that one has to develop or does it work like a tool from the outside in that one has to master? If you are writing an epic fantasy, please be aware that armies do not move thousands of men across vast distances in days…or even weeks….in the olden days, it could take years to get armed military forces, supplies, rations, weapons, and animals from one place to the next. In HBO’s TV adaptation (“Game of Thrones”) of the A Song of Ice and Fire series by George R. R. Martin, multiple epic plot points of the storyline happen in between military movements, in castles far from the bloodshed. So, keep these things in mind as you’re creating the plot line and building up to the epic battle scenes of your story. If you’ve built a world that is expansive, be prepared to play the long game with yourself. Travel over mountains and valleys, desserts and snowy terrain, marsh and beaches. How are the supplies ferried from wherever they come from to the troops? Are there weak points in this system that the enemy can exploit? Who are the major players making these decisions? Who are the major players on the ground working with and over the troops? Do they have the same agenda? If it takes years to get where you want to go in your story because the world you’ve built has to be explored and the science or geography has to be explained, then tell us what is happening during the down time to build up to that climatic moment in the book (or series)? What is building up in the world, in the warring communities, to key individuals and organizations? Make the world you’ve built for your characters work for you, not against you. 2. Define points of interest. I see new writers (and even some veterans) who mess this up in their worldbuilding frequently, so it ranks pretty high on my list. At some point in the writing process, a writer can get so excited about their work and the world they are describing that they take us on a literary tour of every place and point of interest. Well, just like every country has its capitol cities and points of interest, so too should your story, book or poem. If there are a myriad of amazing places to visit in the world you are creating, then that is awesome. We want to read about them all…just not in the same chapter and sometimes not even in the same book. There are sequels for a reason. There are novellas and literary accompaniments (like guidebooks or maps) for a reason. Personally, I think a great example of how to do this well is J. R. Ward’s Black Dagger Brotherhood series. If you haven’t read this dark, paranormal romance then you should. It’s littered with amazing, indecent leading males and females who cover the gamut of hotness, ferocity and chivalry. It is also an epic example of worldbuilding in the modern era. Set in the real life borough of Caldwell, New York, the Brotherhood fight a hidden battle that goes from the city streets to the rural farmlands to underground hospitals to a mansion in the woods to a cave in the mountains to so on and so forth. However, most of each novel takes place in no more than two or three locations. Over the course of 15 plus books, two spin-off series, and a host of novellas and anthology short stories, Ward has taken us through every nook and cranny of this would-be small setting, expanding it with relish and fervor in our minds. But she never felt the need to give us too much at once. As you build the world your characters live in make sure that the major plot points are happening in a manageable amount of places. Not only does it help you keep your story from running away from you, but your reader can process these snapshots of places in each story much more than they can handle being ridden around the globe in every novel you write. 3. A good setting is organic…it develops. The trick to this is that you can’t be afraid of change. I know what you’re thinking. “I spent so much time creating this idea and making it work….” And it can continue to work, but don’t be so frigid about the how. The same way that characters can grow and develop in ways you didn’t originally plan, so can your characters’ world. Maybe the endless universe suddenly comes to an end or the someone kicks over the playground bully’s bike for the first time. Whether the change is small or grand, it doesn’t matter. Epic comes in all sizes. In the Harry Potter series, Hogwarts School of Witchcraft and Wizardry is a perfect case; the entire setting is actually created to shift at will with moving staircases and rooms that change positions and characters in paintings who go from frame to frame throughout the castle. Hogwarts also undergoes numerous transformations during the Golden Trio’s (Harry, Ron and Hermoine’s) time. These changes were not just the physical sort as when the school regenerated itself after the major battle of the last book, but also in the nature of how Rowling described Hogwarts according to what was going on in each novel. There was a sense of awe and amazement during the first novel as Harry acclimated himself to the Wizarding World, and as time went on the magical happenings of Hogwarts began to be described as more and more commonplace because both the main character and the readers were growing accustomed to it. Another example is the atmosphere of the books during Hogwarts’s takeover by the corrupt Ministry of Magic. It goes from being a safe, secure haven to being the threshold of the enemy. Things get darker and heinous very quickly in the same place where peace and joy once reigned. Rowling’s ability to take the same setting and play on different emotions based off of the needs of the scene is amazing. She demonstrates how influential both physical and metaphysical changes in worldbuilding can be. Keep this in mind as you work through your own manuscripts. Are you taking advantage of changes in season, day and night, destruction of important or holy places or maybe even the creation of them to add a different dimension to your story? 4. The setting and the plot should mirror. This step goes hand in hand with the previous one. Just as your setting should develop along with your plot line, it helps to paint a picture for the reader if the setting and plot mirror each other as well. Take for example, the dystopian page-turner Hunger Games by Suzanne Collins about a girl from an outlying, poor district of the fictional country of Panem accidentally getting in the middle of a rebellion to overthrow the country’s despot. Katniss could have grown up in the Middle Ages for all the poverty, wildness and brutality of her original home, District 12, verses the vibrant El Dorado of The Capitol. …as well a harsh and unforgiving wilderness where the children of this country do battle. The genius of Collins’s writing style is that the various settings of Panem play together in such a way as to show the depths of the hypocrisy, classicism, and machiavellianism that run rampant in this culture. The setting pushes the plot without any of the characters necessarily pointing it out. Their reactions and responses to each new place (and how these responses differ from character to character) add a unique layer to the overall themes and arc of the story. 5. Make your setting is the main character of your story. To help keep that organic flow we discussed earlier, you have to think of your setting like it’s another character. What is its backstory? Is it the protagonist or the antagonist? If your world could make a wish, what would it would wish for? Who or what is standing in the way? When worldbuilding you have to have a setting that is as integral to the storyline as the characters themselves. There’s something very anticlimactic about a reading a book, thinking it’s well-written, but it could have taken place anywhere. This was my foremost thought after reading Soundless by critically-acclaimed author Richelle Mead. Now, I’ll mention Ms. Mead again in subsequent posts because I really am a huge fan of her work. Her YA series Vampire Academy and its spin-off Bloodlines totally inspire me as far as emphasizing the diversity of feminine strength and the power of being able to write distinct roles for girls that do not succumb to the same modern pitfalls of most novels. 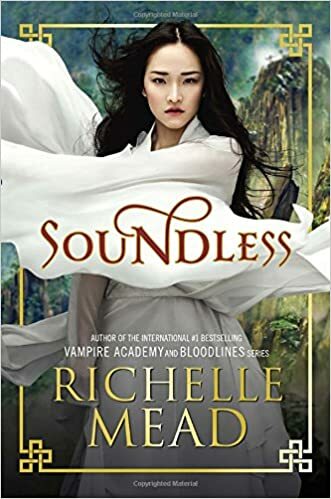 However, Soundless, a story about an ancient Chinese girl from an isolated, deaf-mute village in the mountains who wakes up one day as the first person in generations who can hear, does not meet the mark as Mead’s previous stories did. It wasn’t the characters who were an eclectic mix of youth battling between the traditions of the past and needs of the future or the storyline which had ample plot twists (though the ending was quite contrived). The most basic issue I had with the novel was that it could have happened anywhere. I kept asking myself, “Why is this girl Chinese? Why a mountain? Why not Polynesian and on an island or Scottish-American living on a rural farm?” The characters didn’t the setting, and the setting didn’t need the characters. Their relationship was accommodating towards each other at best. Remember that you can’t force your characters into a world that doesn’t make sense or force your world to adhere to pre-created plot points for your characters. Don’t build up how treacherous a mountain is or how rare the golden goose egg is and then every five chapters someone finds a new egg or scales the mountain with only a few bruises and scrapes. And never write a story where the world you’ve set it in is unimportant to the storyline. It’s one of the most important characters you can write. I hope that these steps help you on your journey towards crafting a better work of art. Writing is something that you have to work at, and you’ll find that all the magic happens in the editing. My goal is that this guide makes your process that much more effective and thoughtful. Are these helpful hints for you or were you expecting something else entirely? There are so many points to better worldbuilding or other books and stories that make great examples beyond the ones mentioned here. Share in the comments what books you would have chosen or which steps help you in your process? This way we all get to be a part of the process. I can’t wait to read what you’re writing!